Our online time clock has multiple ways to track time for volunteers and employees. 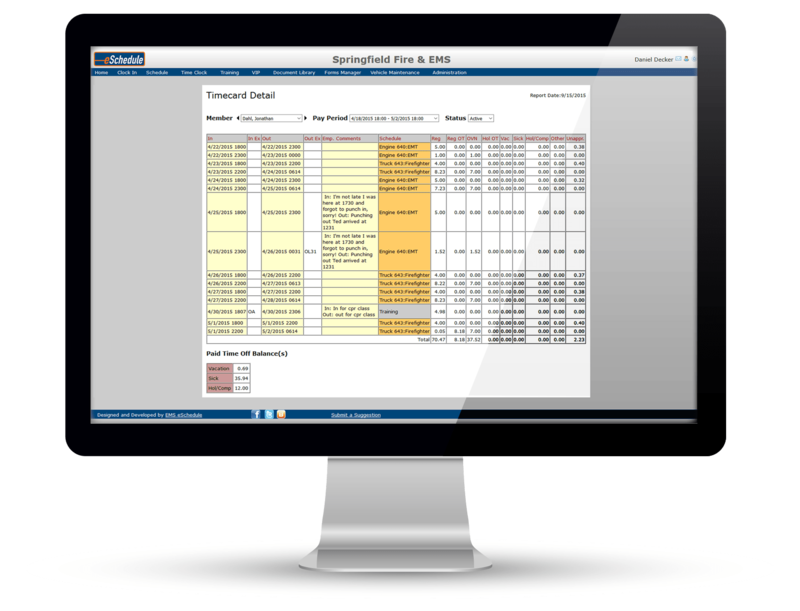 It interacts seamlessly with the Scheduling module as well as your payroll software / company (ADP, Paychex, QuickBooks, etc.). All members of your agency (including volunteers) can punch in & out using our simple web-based time clock interface. Simply enter your username and password and the software will automatically and immediately check the schedule to verify the member is currently scheduled to work. Any discrepancies will require an explanation by the member and approval by a supervisor. Imagine having no more paper time cards! Eliminate the need to manually calculate hours each week. Reduce the risk of human error. eSchedule will take care of it all. Employees Don’t Punch In & Out? Even if your employees don’t punch in and out because they’re salaried, you can still benefit from using this feature. The Timekeeping Module is so much more than just a way to punch in and out. You can keep track of PTO/vacation requests, comp time or simply keep track of hours worked/volunteered based on the schedule. Get access to one of our demo sites. Play around with eSchedule for free! Let’s do it!